She spent two weeks on the run in Melbourne’s north, was chased for hours by red-faced animal rangers and dodged cars on a busy freeway, before being caught by a TV camera assistant and brought into a shelter where her neighbour was a poodle. All of which made international news. It’s no wonder the little goat has been re-named Calamity Jane by her new owner at Edgar’s Mission, Pam Ahern. Yesterday Pam came to collect her latest recruit to the farm, bringing a special guest to help make Jane’s journey a little more comfortable. Kenny the goat was introduced to the young female and after enjoying a bite to eat and having a friendly game of ‘head butts’, the two were firm friends. Jane will be joining Kenny and around 20 other goats at Edgar’s Mission, where Pam said she will spend the rest of her days socialising and playing on a special goat jungle-gym. Most importantly, little Jane will never have to fear for her life again. 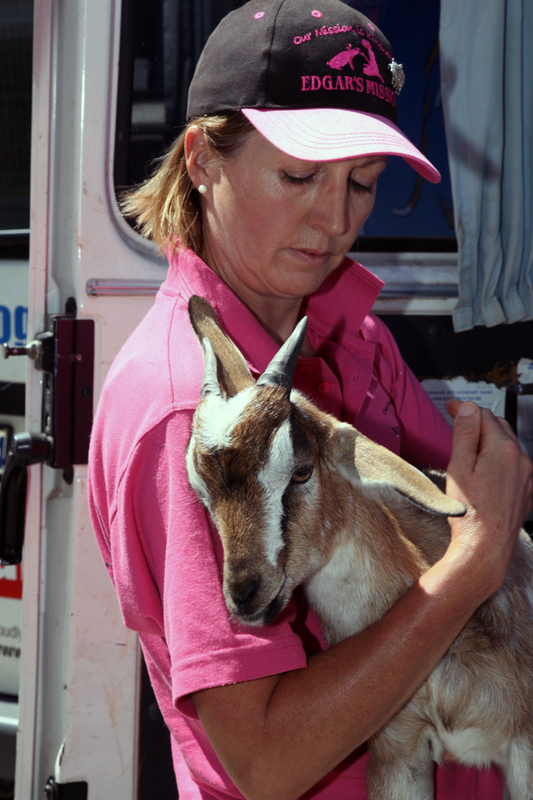 See the coverage by Channel Nine news and watch our farewell video to the little goat who stole our hearts.